This invention relates to poly(ester amide)s (PEAs) comprising inactivated terminal amino and carboxyl groups, methods of synthesizing the inactivated PEAs and uses for them in the treatment of vascular diseases. This invention generally relates to end-capped poly(ester amide) copolymers useful in the manufacture or coating of an implantable medical device. Poly(ester amide)s (PEA)s are useful as polymeric carriers of bioactive substances when coated on implantable medical devices such as stents to reduce restenosis and other problems associated with the treatment of atherosclerosis (see, e.g., U.S. Pat. No. 6,503,538, B1). PEAs can be made by condensation polymerization of a diamino compound with a diester dicarboxylic acid (Scheme I). In Scheme I, the dicarboxylic acids are converted to an active di-p-nitrophenyl derivative to facilitate the polymerization. When the dicarboxylic acid and the diamino subunits are used stoichiometrically, the PEA formed has one terminal carboxylic acid group and one terminal amino group. When the dicarboxylic acid and the diamino subunits are not used in a 1:1 ratio, the PEA formed can have excess terminal carboxylic acid groups if more of the dicarboxylic acid subunit is used or excess terminal amino groups if more of the diamino subunit is used. Reactive end groups in PEAs can be problematic. First, since active amino and active carboxyl end groups are present, polymerization can continue. Second, if the PEA formed is combined with a drug that possesses an functional group capable of reacting with a carboxyl (activated or unactivated) or amino group, it is possible that the drug will react and covalently attach to the PEA, essentially rendering the drug unavailable for therapeutic use. What is needed are PEAs in which the end groups are rendered inactive so as to avoid the above problem and any other than might arise because of the presence of the active terminal functional groups. The present invention provide such PEAs and methods for preparing them. Thus, an aspect of the present invention is a poly(ester amide) (PEA) comprising inactivated terminal amino groups and inactivated terminal carboxyl groups wherein the inactivated terminal amino groups are end-capped and the inactivated terminal carboxyl groups are either the free acid, a salt thereof or are end-capped. In an aspect of this invention, at least 50% of the terminal amino groups have been inactivated and at least 50% of the terminal carboxyl groups have been inactivated. In an aspect of this invention, at least 90% of the terminal amino groups have been inactivated and at least 90% of the terminal carboxyl groups have been inactivated. In an aspect of this invention, at least 99% of the terminal amino groups have been inactivated and at least 99% of the terminal carboxyl groups have been inactivated. In an aspect of this invention, the terminal amino groups or the terminal carboxyl groups are inactivated by reaction with a bioactive agent. An aspect of this invention is a method of inactivating a poly(ester amide) (PEA), comprising end-capping terminal amino groups by reaction with a first chemical agent and end-capping terminal carboxyl groups with a second chemical agent. In an aspect of this invention, the first chemical agent or the second chemical agent in the above method is a bioactive agent. In aspect of this invention is a coating for an implantable medical device comprising the PEA of claim 1. In an aspect of this invention, the coating further comprising a biocompatible polymer or a biobeneficial or a bioactive agent or any combination thereof. In an aspect of this invention, in the above coating the implantable medical device is a stent. In an aspect of this invention, in the above coating, the implantable medical device is a stent. An aspect of this invention is an implantable medical device formed of a material comprising a PEA of claim 1. In an aspect of this invention, with regard to the above implantable medical device, the material further comprises a bioactive agent. In an aspect of this invention with regard to the above coating and the above implantable medical device, the bioactive agent is selected from the group consisting of paclitaxel, docetaxel, estradiol, nitric oxide donors, super oxide dismutases, super oxide dismutase mimics, 4-amino-2,2,6,6-tetramethylpiperidine-1-oxyl(4-amino-TEMPO), tacrolimus, dexamethasone, rapamycin, rapamycin derivatives, 40-O-(2-hydroxy)ethyl-rapamycin (everolimus), 40-O-(3-hydroxy)propylrapamycin, 40-O-[2-(2-hydroxy)ethoxy]ethylrapamycin, and 40-O-tetrazole-rapamycin, ABT-578, clobetasol, progenitor cell capturing antibody, prohealing drugs, prodrugs thereof, co-drugs thereof, and a combination thereof. An aspect of this invention is a method of treating or preventing a disorder in a patient in need thereof comprising implanting in the patient an implantable device comprising the coating of claim 12, wherein the disorder is selected from the group consisting of atherosclerosis, thrombosis, restenosis, hemorrhage, vascular dissection or perforation, vascular aneurysm, vulnerable plaque, chronic total occlusion, claudication, anastomotic proliferation for vein and artificial grafts, bile duct obstruction, ureter obstruction, tumor obstruction, and combinations thereof. wherein m is an integer, n is 0 or an integer; X, Y, Z1 and Z2 are independently branched or straight chain alkyl, cycloalkyl, alkenyl, alkynyl, aryl, heteroaryl, heteroalicyclic or any combinations thereof and any of which may be optionally substituted. A nonlimiting example of such a PEA is shown in Scheme 1 above. Other exemplary PEAs are described in, e.g., U.S. Pat. No. 6,503,538 B1. In the synthesis of PEAs it is often desirable to activate the carboxyl groups of the dicarboxy monomer to facilitate the condensation with the diamines. This is most often accomplished by a reaction that substitutes for the hydrogen of the free carboxylic acid (—C(O)OH) or the alkyl group of an inactive ester such as a methyl or ethyl ester (—C(O)OCH3), —C(O)OCH2CH3) an entity that has the property of being a good leaving group. Thus, the carboxyl groups can be activated by any number of methods well-known to those skilled in the art. All such methods as well as any that might be devised in the future are within the scope of this invention. Among these activating functionalities are, without limitation, mononitrophenyl compounds such as p-nitrophenyl, m-nitrophenyl or o-nitrophenyl, dinitrophenyl compounds, trinitrophenyl compounds, and phenyl groups bearing one, two, or three cyano, halogen, keto, ester, or sulfone groups. The amino groups of the diamine monomer used in the synthesis of the PEA generally need no further activation, they are sufficiently active in their own right. 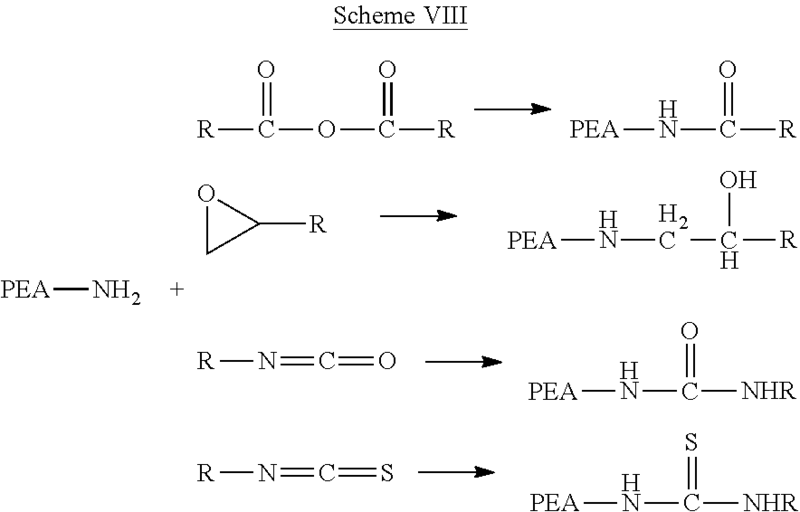 As used herein, a “terminal amino group” and a “terminal carboxyl group” refer to the groups at the end of PEA chains as exemplified in Scheme I). As used herein “end-capping” refers to the reaction of a terminal amino group and/or a terminal carboxyl group with one or more moiety(ies) that alters the chemical properties of the terminal group, rendering it less likely to spontaneously react with other functionalized compounds with which they may come in contact such as, in particular for the purposes of this invention, bioactive agents. The thus-altered amino or carboxyl group can be referred to as “inactivated.” For the purposes of this invention, “end-capping” a terminal carboxyl group includes simply hydrolyzing or otherwise substituting an activating moiety on the carboxyl group with an hydrogen atom to form the free acid (—C(O)OH) or a salt thereof. The end-capped PEA may optionally contain in its polymeric matrix one or more biocompatible polymers (that may be biodegradable, bioabsorbable, non-biodegradable, or non-bioabsorbable) other than a PEA, a biobeneficial material, a bioactive agent or any combination of these. As such, the composition can be used to coat an implantable device or to form the implantable device itself, such as, without limitation, a stent. The amino active groups on the PEA can be end-capped first. The end-capping process is a separate reaction done after the polymerization. The PEA may, or may not be purified before the amino endcapping reaction. In Scheme VIII, R is an alkyl moiety, which can be saturated or unsaturated, linear or branched alkyl or a cycloalkyl or an aryl moiety. Preferably, R is an alkyl or cycloalkyl with 2-12 carbons. Or the p-nitrophenol ester may also be reacted with reducing agents such as sodium borohydride or sodium cyanoborohydride to convert the ester to a hydroxyl group. Other means of inactivating the carboxyl group will become apparent to those skilled in the art based on the disclosures herein. All such inactivating techniques are within the scope of this invention. The biocompatible polymer that can be used with the end-capped PEA in the coatings or medical devices described herein can be any biocompatible polymer known in the art, which can be biodegradable or nondegradable. Representative examples of polymers that can be used to coat an implantable device in accordance with the present invention include, but are not limited to, ethylene vinyl alcohol copolymer (EVOH, EVAL), poly(hydroxyvalerate), poly(L-lactic acid), poly(L-lactide), poly(D,L-lactide), poly(L-lactide-co-D,L-lactide), polycaprolactone, poly(lactide-co-glycolide), poly(hydroxybutyrate), poly(hydroxybutyrate-co-valerate), polydioxanone, polyorthoester, polyanhydride, poly(glycolic acid), poly(D,L-lactic acid), poly(D,L-lactide-co-glycolide) (PDLLAGA), poly(glycolic acid-co-trimethylene carbonate), polyphosphoester, polyphosphoester urethane, poly(amino acids), polycyanoacrylates, poly(trimethylene carbonate), poly(iminocarbonate), poly(butylene terephthalate-co-PEG-terephthalate), polyurethanes, polyphosphazenes, silicones, polyesters, polyolefins, polyisobutylene and ethylene-alphaolefin copolymers, acrylic polymers and copolymers, vinyl halide polymers and copolymers, such as polyvinyl chloride, polyvinyl ethers, such as polyvinyl methyl ether, polyvinylidene halides, such as vinylidene fluoride (without limitation Solef™ or Kynar™), polyvinylidene fluoride (PVDF) or poly(vinylidene-co-hexafluoropropylene) (PVDF-co-HFP), polyvinylidene chloride, polyacrylonitrile, polyvinyl ketones, polyvinyl aromatics, such as polystyrene, polyvinyl esters, such as polyvinyl acetate, copolymers of vinyl monomers with each other and olefins, such as ethylene-methyl methacrylate copolymers, acrylonitrile-styrene copolymers, ABS resins, and ethylene-vinyl acetate copolymers, polyamides, such as Nylon 66 and polycaprolactam, alkyd resins, polycarbonates, polyoxymethylenes, polyimides, polyethers, poly(glyceryl sebacate), poly(propylene fumarate), epoxy resins, polyurethanes, rayon, rayon-triacetate, cellulose acetate, cellulose butyrate, cellulose acetate butyrate, cellophane, cellulose nitrate, cellulose propionate, cellulose ethers, and carboxymethyl cellulose. The biocompatible polymer can provide controlled release of a bioactive agent if such is included in the coating and/or if binding the bioactive agent to a substrate, which can be the surface of an implantable device or a coating thereon. Controlled release and delivery of bioactive agent using a polymeric carrier has been extensively researched in the past several decades (see, for example, Mathiowitz, Ed., Encyclopedia of Controlled Drug Delivery, C.H.I.P.S., 1999). For example, PLA based drug delivery systems have provided controlled release of many therapeutic drugs with various degrees of success (see, for example, U.S. Pat. No. 5,581,387 to Labrie, et al.). The release rate of the bioactive agent can be controlled by, for example, selection of a particular type of biocompatible polymer, which can provide a desired release profile of the bioactive agent. The release profile of the bioactive agent can be further controlled by selecting the molecular weight of the biocompatible polymer and/or the ratio of the biocompatible polymer to the bioactive agent. Additional ways to control the release of the bioactive agent are specifically designing the polymer coating construct, conjugating the active agent onto the polymeric backbone, designing a micro-phase-separated PEA where the agent resides in the more mobile segment, and designing a PEA in which the bioactive has an appropriate level of solubility. One of ordinary skill in the art can readily select a carrier system using a biocompatible polymer to provide a controlled release of the bioactive agent. Examples of the controlled release carrier system can come from the examples provided above; however, other possibilities not provided are also achievable. A presently preferred biocompatible polymer is a polyester, such as PLA, PLGA, PGA, PHA, poly(3-hydroxybutyrate) (PHB), poly(3-hydroxybutyrate-co-3-hydroxyvalerate), poly((3-hydroxyvalerate), poly(3-hydroxyhexanoate), poly(4-hydroxybutyrate), poly(4-hydroxyvalerate), poly(4-hydroxyhexanoate), and a combination thereof, and polycaprolactone (PCL). The end-capped PEA described herein can form a coating on an implantable medical device or can form the device itself where one or more bioactive agents are contained in the polymeric matrix. The bioactive agent(s) can be any which has a therapeutic, prophylactic or diagnostic effect. These agents can have, without limitation, anti-proliferative, anti-inflammmatory, antineoplastic, antiplatelet, anti-coagulant, anti-fibrin, antithrombonic, antimitotic, antibiotic, antiallergic, antioxidant or cystostatic properties. Examples of suitable therapeutic and prophylactic agents include synthetic inorganic and organic compounds, proteins and peptides, polysaccharides and other sugars, lipids, and DNA and RNA nucleic acid sequences having therapeutic, prophylactic or diagnostic activities. Nucleic acid sequences include genes, antisense molecules which bind to complementary DNA to inhibit transcription, and ribozymes. Some other examples of other bioactive agents include antibodies, receptor ligands, enzymes, adhesion peptides, blood clotting factors, inhibitors or clot dissolving agents such as streptokinase and tissue plasminogen activator, antigens for immunization, hormones and growth factors, oligonucleotides such as antisense oligonucleotides and ribozymes and retroviral vectors for use in gene therapy. Examples of anti-proliferative agents include rapamycin, 40-O-(2-hydroxy)ethyl-rapamycin (everolimus), methyl rapamycin (ABT-578), 40-O-(3-hydroxy)propyl-rapamycin, 40-O-[2-(2-hydroxy)ethoxy]ethyl-rapamycin, 40-O-tetrazole-rapamycin, paclitaxel and, docetaxel. Examples of antineoplastics and/or antimitotics include methotrexate, azathioprine, vincristine, vinblastine, fluorouracil, doxorubicin hydrochloride (e.g. Adriamycin® from Pharmacia & Upjohn, Peapack N.J.), and mitomycin (e.g. Mutamycin® from Bristol-Myers Squibb Co., Stamford, Conn.). Examples of antiplatelet, anticoagulant, antifibrin and antithrombin compounds include, again without limitation, sodium heparin, low molecular weight heparins, heparinoids, hirudin, argatroban, forskolin, vapiprost, prostacyclin, dextran, D-phe-pro-arg-chloromethylketone (synthetic antithrombin), dipyridamole, glycoprotein IIb/IIIa platelet membrane receptor antagonist antibody, recombinant hirudin, thrombin inhibitors such as Angiomax ä (Biogen, Inc., Cambridge, Mass. ), calcium channel blockers (such as nifedipine), colchicine, fibroblast growth factor (FGF) antagonists, fish oil (omega 3-fatty acid), histamine antagonists, lovastatin (an inhibitor of HMG-CoA reductase, a cholesterol lowering drug, brand name Mevacor® from Merck & Co., Inc., Whitehouse Station, N.J.), monoclonal antibodies (such as those specific for Platelet-Derived Growth Factor (PDGF) receptors), nitroprusside, phosphodiesterase inhibitors, prostaglandin inhibitors, suramin, serotonin blockers, steroids, thioprotease inhibitors, triazolopyrimidine (a PDGF antagonist), nitric oxide or nitric oxide donors, super oxide dismutases, super oxide dismutase mimetic, 4-amino-2,2,6,6-tetramethylpiperidine-1-oxyl(4-amino-TEMPO), estradiol, anticancer agents, dietary supplements such as various vitamins, and a combination thereof. Examples of anti-inflammatory agents including steroidal and non-steroidal anti-inflammatory agents include tacrolimus, dexamethasone, clobetasol, combinations thereof. Examples of such cytostatic substance include angiopeptin, angiotensin converting enzyme inhibitors such as captopril (e.g. Capoten® and Capozide® from Bristol-Myers Squibb Co., Stamford, Conn.), cilazapril or lisinopril (e.g. Prinivil® and Prinzide® from Merck & Co., Inc., Whitehouse Station, N.J.). An example of an antiallergic agent is permirolast potassium. Other therapeutic substances or agents which may be appropriate include alpha-interferon, bioactive RGD, and genetically engineered epithelial cells. The foregoing substances can also be used in the form of prodrugs or co-drugs thereof. Other active agents which are currently available or that may be developed in the future are equally applicable. The biobeneficial material that can be used with the end-capped PEA to form a coating on or an implantable medical device per se as described herein can be a polymeric material or non-polymeric material. The biobeneficial material is preferably flexible, biocompatible and biodegradable. A biobeneficial material is one which enhances the biocompatibility of a device by being non-fouling, hemocompatible, actively non-thrombogenic, or anti-inflammatory, all without depending on the release of a pharmaceutically active agent. Generally, a biobeneficial material has a relatively low glass transition temperature (Tg). In some embodiments, the Tg is below human body temperature. This attribute renders the biobeneficial material relatively soft as compared to the biocompatible polymer and allows a layer of coating containing the biobeneficial material to fill any surface damages that may arise when an implantable medical device is coated with a layer comprising the biocompatible polymer. For example, during radial expansion of the stent, a more rigid biocompatible polymer can crack or have surface fractures. A softer biobeneficial material can fill in the crack and fractures. Another attribute of a biobeneficial material is hydrophilicity. The hydrophilicity of the biobeneficial agent contributes to the overall hydrophilicity of the coating containing the agent. Generally, the higher the hydrophilicity of a coating, the higher the drug release rate from that coating and the higher the degradation rate of the coating. Representative biobeneficial materials include, but are not limited to, polyethers such as poly(ethylene glycol), copoly(ether-esters) (e.g. PEO/PLA); polyalkylene oxides such as poly(ethylene oxide), poly(propylene oxide), poly(ether ester), polyalkylene oxalates, polyphosphazenes, phosphoryl choline, choline, poly(aspirin), polymers and co-polymers of hydroxyl bearing monomers such as hydroxyethyl methacrylate (HEMA), hydroxypropyl methacrylate (HPMA), hydroxypropylmethacrylamide, poly (ethylene glycol) acrylate (PEGA), PEG methacrylate, 2-methacryloyloxyethylphosphorylcholine (MPC) and n-vinyl pyrrolidone (VP), carboxylic acid bearing monomers such as methacrylic acid (MA), acrylic acid (AA), alkoxymethacrylate, alkoxyacrylate, and 3-trimethylsilylpropyl methacrylate (TMSPMA), poly(styrene-isoprene-styrene)-PEG (SIS-PEG), polystyrene-PEG, polyisobutylene-PEG, polycaprolactone-PEG (PCL-PEG), PLA-PEG, poly(methyl methacrylate)-PEG (PMMA-PEG), polydimethylsiloxane-co-PEG (PDMS-PEG), poly(vinylidene fluoride)-PEG (PVDF-PEG), PLURONIC™ surfactants (polypropylene oxide-co-polyethylene glycol), poly(tetramethylene glycol), hydroxy functional poly(vinyl pyrrolidone), biomolecules such as fibrin, fibrinogen, cellulose, starch, collagen, dextran, dextrin, hyaluronic acid, fragments and derivatives of hyaluronic acid, heparin, fragments and derivatives of heparin, glycosamino glycan (GAG), GAG derivatives, polysaccharide, elastin, chitosan, alginate, silicones, and combinations thereof. In a preferred embodiment, the biobeneficial material is a block copolymer having flexible poly(ethylene glycol) and poly(butylene terephthalate) blocks (PEG/PBT, e.g., PolyActive™). PolyActive™ includes AB, ABA and BAB copolymers where A is PEG and B is PBT. As used herein, an implantable device may be any suitable medical substrate that can be implanted in a human or veterinary patient. Examples of such implantable devices include self-expandable stents, balloon-expandable stents, stent-grafts, grafts (e.g., aortic grafts), artificial heart valves, cerebrospinal fluid shunts, pacemaker electrodes, and endocardial leads (e.g., FINELINE and ENDOTAK, available from Guidant Corporation, Santa Clara, Calif.). The underlying structure of the device can be of virtually any design. The device can be made of a metallic material or an alloy such as, but not limited to, cobalt chromium alloy (ELGILOY), stainless steel (316 L), high nitrogen stainless steel, e.g., BIODUR 108, cobalt chrome alloy L-605, “MP35N,” “MP20N,” ELASTINITE (Nitinol), tantalum, nickel-titanium alloy, platinum-iridium alloy, gold, magnesium, or combinations thereof. “MP35N” and “MP20N” are trade names for alloys of cobalt, nickel, chromium and molybdenum available from Standard Press Steel Co., Jenkintown, Pa. “MP35N” consists of 35% cobalt, 35% nickel, 20% chromium, and 10% molybdenum. “MP20N” consists of 50% cobalt, 20% nickel, 20% chromium, and 10% molybdenum. Devices made from bioabsorbable or biostable polymers could also be used with the embodiments of the present invention. In accordance with embodiments of the invention, a coating of the various described embodiments can be formed on an implantable medical device or prosthesis, e.g., a stent. For coatings including one or more active agents, the agent will be retained on the device during delivery and expansion and then will be released at a desired rate and for a predetermined duration at the site of implantation. Preferably at present, the medical device is a stent. A stent having the above-described coating is useful for a variety of medical procedures, including, without limitation, treatment of obstructions caused by tumors in bile ducts, esophagus, trachea/bronchi and other biological passageways. A stent having the above-described coating is particularly useful for treating occluded regions of blood vessels caused by atherosclerosis, abnormal or inappropriate migration and proliferation of smooth muscle cells, thrombosis, and restenosis. Stents may be placed in a wide array of blood vessels, both arteries and veins. Representative examples of sites include the iliac, renal, and coronary arteries. The following examples are for illustrative purposes only and are not intended nor should they be construed as limiting the scope of this invention in any manner. Dry triethylamine (61.6 ml, 0.44 mole) is added to a mixture of di-p-toluenesulfonic acid salt of bis-(L-leucine)-1,6-hexylene diester (120.4 g, 0.18 mole), di-p-toluenesulfonic acid salt of L-lysine benzyl ester (11.61 g, 0.02 mole), and di-p-nitrophenyl sebacinate (88.88 g, 0.2 mole) in dry DMF (110 ml). The mixture is stirred and heated at 80° C. for 12 hours. 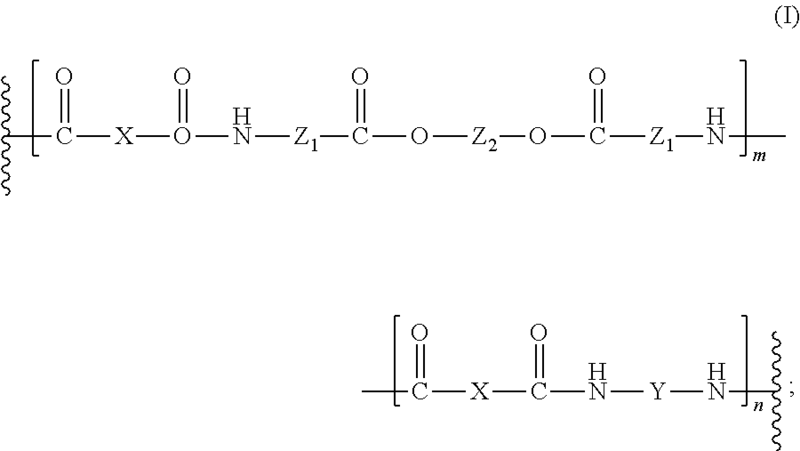 The active amino end groups on the PEA prepared in Example 1 can be endcapped as follows: While stirring, the DMF/PEA solution of Example 1 is cooled to 0° C. Triethylamine (0.0057 mole) is added and acetyl chloride (0.448 g, 0.0057 mole) is added dropwise to the mixture. Stirring is continued for 12 hours while the solution is allowed to equilibrate to room temperature. The solution is diluted with ethanol (300 ml), and poured into one liter of deionized water. The precipitated polymer is collected, extracted with two, one liter portions of phosphate buffer (0.1M, pH 7), a final, one liter portion of deionized water, isolated by suction filtration, and vacuum dried at 40° C.
The active amino endgroups on the PEA prepared in Example 1 can also be endcapped as follows: Ethyl acrylate (0.571 g, 0.0057 mole) is added to the DMF/PEA solution of Example 1. Phosphoric acid (0.011 g, 0.000114 mole) is added as an acid catalyst. With stirring, the solution is heated to 100° C. and stirred for 60 minutes. The solution is diluted with ethanol (300 ml), and poured into one liter of deionized water. The precipitated polymer is collected, extracted with two, one liter portions of phosphate buffer (0.1M, pH 7), a final, one liter portion of deionized water, isolated by suction filtration, and vacuum dried at 40° C.
A medical article with two layers can be fabricated to comprise everolimus by preparing a first composition and a second composition, wherein the first composition is a layer containing a bioactive agent which includes a matrix of the PEA of Example 2 and a bioactive agent, and the second composition is a topcoat layer comprising the PEA of Example 2. The first composition can be prepared by mixing about 2% (w/w) of the PEA of Example 2 and about 0.33% (w/w) everolimus in absolute ethanol, sprayed onto a surface of a bare, 12 mm VISION™ stent (Guidant Corp.) and dried to form a coating. An exemplary coating technique involves spray coating with a 0.014 fan nozzle, a feed pressure of about 0.2 atm, and an atomization pressure of about 1.3 atm; applying about 20 μg of wet coating per pass; drying the coating at about 62° C. for about 10 seconds between passes and baking the coating at about 50° C. for about 1 hour after the final pass to form a dry agent layer. The layer containing a bioactive agent would be comprised of about 336 μg of the PEA of Example 2 and about 56 μg of everolimus. The second composition can be prepared by mixing about 2% (w/w) of the PEA of Example 2 in absolute ethanol. The solution is then applied over the dried agent layer using the same coating technique above. The topcoat would contain about 400 μg of the PEA of Example 2. The total weight of the stent coating would be about 792 μg. 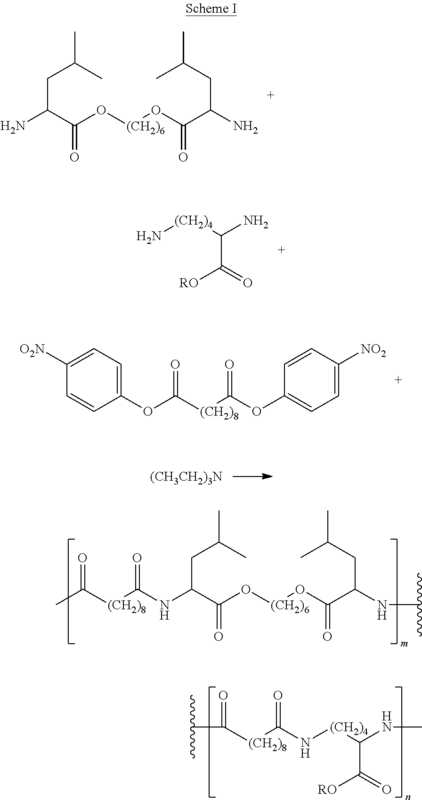 Inactivated Terminal Amino Group is: —NR3+X−, wherein X is Br, Cl, or I, and each R is a primary or secondary alkyl radical having 2 to 12 carbon atoms; —NHC(O)R, wherein R is a primary or secondary alkyl radical having 2 to 12 carbon atoms; —NHR, wherein R is a primary or secondary alkyl radical having 2 to 12 carbon atoms; —N(C(R)3)2, wherein each R is hydrogen or a primary or secondary alkyl radical having 2 to 12 carbon atoms; —CH═CH2; —NO2; —NHC(O)R, wherein R is cycloalkyl, aryl, or a saturated, linear or branched alkyl; —NHCH2CH(OH)R, wherein R is cycloalkyl, aryl, or a saturated, linear or branched alkyl; —NHC(O)NHR, wherein R is cycloalkyl, aryl, or a saturated, linear or branched alkyl; —NHC(S)NHR, wherein R is cycloalkyl, aryl, or a saturated, linear or branched alkyl; or —NHCH2CH2C(O)R, wherein R is hydrogen, a primary or secondary alkyl radical having 2 to 12 carbon atoms, or OR′, wherein R′ is a primary or secondary alkyl radical having 2 to 12 carbon atoms. 2. A coating for an implantable medical device comprising the polymer of claim 1. 3. The coating of claim 2, wherein the implantable medical device is a stent. Chandrasekar et al., Coronary Artery Endothelial Protection After Local Delivery of 17beta-Estradiol During Balloon Angioplasty in a Porcine Model: A Potential New Pharmacologic Approach to Improve Endothelial Function, J. of Am. College of Cardiology, vol. 38, No. 5, (2001) pp. 1570-1576. Chandrasekar et al., Coronary Artery Endothelial Protection After Local Delivery of 17β-Estradiol During Balloon Angioplasty in a Porcine Model: A Potential New Pharmacologic Approach to Improve Endothelial Function, J. of Am. College of Cardiology, vol. 38, No. 5, (2001) pp. 1570-1576. De Lezo et al., Intracoronary Ultrasound Assessment of Directional Coronary Atherectomy: Immediate and Follow-Up Findings, JACC vol. 21, No. 2, (1993) pp. 298-307. Moreno et al., Macrophage Infiltration Predicts Restenosis After Coronary Intervention in Patients with Unstable Angina, Circulation, vol. 94, No. 12, (1996) pp. 3098-3102. Nordrehaug et al., A novel biocompatible coating applied to coronary stents, EPO Heart Journal 14, p. 321 (p. 1694), Abstr. Suppl. (1993). Oikawa et al., Mechanisms of Acute Gain and Late Lumen Loss After Atherectomy in Different Preintervention Arterial Remodeling Patterns, The Am. J. of Cardilogy, vol. 89, (2002) pp. 505-510. Scully et al., Effect of a heparan sulphate with high affinity for antithrombin III upon inactivation of thrombin and coagulaton Factor Xa, Biochem J. 262, (1989) pp. 651-658. Search Report for PCT/US2005/037326, filed Oct. 18, 2005, mailed Apr. 6, 2006, 14 pgs. Virmani et al., Lessons From Sudden Coronary Death a Comprehensive Morphological Classification Scheme for Atherosclerotic Lesions, Arterioscler Thromb Vasc Biol. (2000) pp. 1262-1275.